A department with a history of shooting their own K9 units has shot another dog after it attacked one of their own. 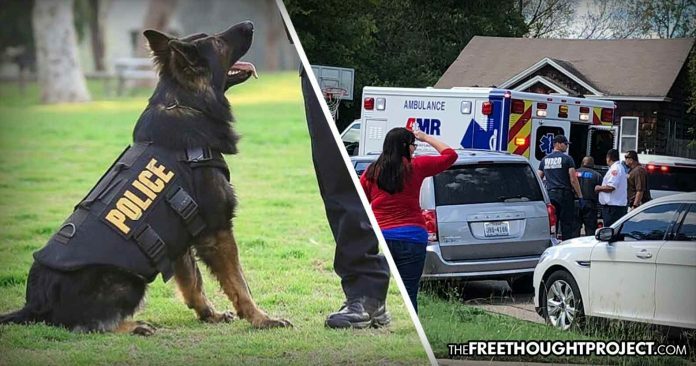 Waco, TX — As the Free Thought Project has consistently reported, police K9 units have attacked everyone from babies to the elderly to everyone in between. Most of this is done without consequence and as a recent case out of Texas shows, literally anyone can fall victim, including the very officer tasked with handling the K9. On Friday, police were serving an arrest warrant at a North Waco home around 12:30 p.m. The officers became involved in a stand off with the suspect who was not even in the home. During the time police were attempting to enter the home, the K9 turned on his handler and began to attack him. As the dog was biting his handler, the officer’s partner pulled out his gun and shot the Belgian Malinois. “At that point, another officer on scene was forced to put down the canine to save the officer,” Officer Garen Bynum said. “The other officer at the scene was forced to put down the K9 to save the officer. The handler, who is also a Waco PD officer, was sent to the hospital with minor injuries,” as statement from the department read. Police did not name the dog nor the officer involved in the shooting. However, the Waco Police Department has had three dogs in its K-9 unit: Kastor, Kempi and Hondo. What’s more, police never found the suspect who was the subject of the warrant. In 2015, an innocent child mauled by a K9 in Waco. Instead of retiring the dog, the department kept him on the force after just a brief time in quarantine. This was in spite of the fact that officer Joseph Ballew caught training the K9 named “Ace” to be aggressive and vicious. After an internal investigation conducted by the McLennan County Sheriff’s Department, Ballew was formally reprimanded, but was able to keep his job and faced no legal penalties. In 2001, another Waco police officer shot and killed his K9 partner when the dog attacked another officer who had come up on it from behind, reported the Waco Tribune-Herald. Also, just last month, a police officer in Columbus, Ohio was forced to shoot his own K9 after it attacked him. As the AP reported, the dog, a 3 ½-year-old male Belgian Malinois named Benzi, was euthanized by a veterinarian. “The use of dogs in police business is inhumane both for the animals, and the suspects who they are often unleashed on. Our society shuns animal abusers and people who raise dogs specifically for fighting, and rightfully so, but how are police dogs any different than an attack dog than a street gang breeds to be as aggressive as possible, for the purpose of winning money in dogfights and intimidating rivals? In a recent case out of Indianapolis, IN, as TFTP reported last week, an innocent pregnant mother was brutally attacked by a police K9. The case became even more disturbing this month after a U.S. district court judge ruled that the woman’s rights were not violated because she was an “innocent bystander” during the incident.